The Mandelson resignation revealed some of the close personal connections of the man himself and other Ministers with wealthy businessmen and women. 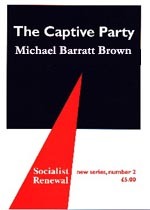 In this little book Michael Barratt Brown reveals, with much detailed evidence, that this is but a tip of the iceberg. Beneath the surface there is a massive bonding between New Labour and Big Business, British and American.